It’s Good to Be Back at Camp! Last year, while on Sabbatical, we didn’t have the chance to come to camp (Hess Kramer and Gindling Hilltop Camp) because we spent the summer in Israel. But coming back to camp this summer is a reminder as to why I love it so and why our kids do too. When I first arrived and got settled in my room I heard a strange sound for Southern California in the summer – rain! It was just enough to get the outside chapel too wet for us to have evening services outside. I was disappointed that we were moved to Baruh Hall. I took the time before services to go on a walk to the Menorah. For those who have never been here before, the Menorah at Hess Kramer overlooks the ocean and is appropriately named “Rabbi Alfred Wolf’s Inspiration Point.” And inspirational it truly is. There, as I stood overlooking the waves, a rainbow appeared, arching between sea and mountain. Absolutely spectacular! I returned to Baruh Hall for services and in came over 200 campers and staff. As with any large group in a room with strong acoustics, it took a while to get them settled and ready to pray. No prayerbooks were passed out, rather, there was a screen with the prayers projected in the front of the room. Tonight, while we might not be outside we had the opportunity to experience prayer in a different way – looking up! Services began and the camp community sang out. While I know that there is a strong level of participation in services at camp, tonight, everyone had the opportunity to truly hear how their prayers sounded. Usually, in the outside chapel, the sound dissipates into the surrounding trees and valley. But tonight, being in this enclosed space, we had the opportunity to really listen to our voices sing out in praise. While I would not want every camp service to be inside – that’s just not camp – it was a great opportunity for the camp community to truly hear our voices. And finally, in this space, within the walls of Baruh Hall, we were surrounded by the work of a great woman, Geri Schusterman, z’l, and the spirit of her beloved husband, Mel, z’l, who passed away this past year. Both of them dedicated years of their lives and their creative spirits to Camp Hess Kramer. Geri’s artwork is all around camp and for the most part, the colors have not faded. They tell a story of campers and a community now 60 years old. The campers and I’m sure most of the staff have no idea who created these beautiful pieces of art that adorn the camp – I wish they did. They would have loved to spend time with both Geri and Mel. But I would like to think that Geri and Mel are still here, still a part of Camp Hess Kramer, and lending their creative spirit still today. And this was just the first day! These are the words of blessing I shared with my daughter, DovLev, as she became a Bat Mitzvah! I’m so proud of her and grateful for all of her blessings. You made it very clear to me that I was not to “wing” this blessing for you. True, there are so many moments in a service that inspire me to speak to the Bar or Bat Mitzvah when we are at the ark. But today, this moment, I speak to you not as a rabbi, but today, I speak to you in the most important role I have…I speak to you, my daughter, as your Ima. And, while I want to share each moment, from the time you were born, and when we welcomed you to our family, our covenant and this community to every amazing moment we’ve shared, and even some of the challenging, I know that there is too much to share now. But I do want you to know, we are so proud of all that you are and everything you do. In the book of Psalms, Psalm 119, which is the longest of all the chapters, 176 verses to be exact, is written as an acrostic. Each Hebrew letter is represented by 8 versus. There is a tradition of using one’s Hebrew name and writing that person their own personal Psalm. So today, I have written you your own Psalm, carefully choosing verses that I feel reflect you and are words for you to hold on to for the years ahead. 27: Make me understand the way of Your precepts, that I may study Your wondrous acts. The world around you is so wonderful. Take time to explore it and enjoy it. Lift your eyes up and enjoy all the beauty that exists in this world and how you are a part of it. You can strive to achieve greatness in all that you do. Some day you will achieve your goal and become who you dream to be. But always remember, even in greatness, even in glory, the simple things in life are the most precious – these are the things that money cannot buy, but can only be created and appreciated by you and everyone in our world. 76: May Your steadfast love comfort me in accordance with Your promise to Your servant. Always feel God’s love surrounding you. This love comes in all forms. From the love of Aba and me, the love of your brother, Yoni, who you should remember, you only have one of, so cherish him. To the love of your extended family and your friends. Recognizing this love you are given and seeing that it is a gift that will fulfill the promise God makes to you each and every day. 171: My lips shall pour forth praise, for You teach me Your laws. Torah has been on your lips from the day your were born. You learned how to chant blessings and bring the love of Torah and your Jewish self into your life very early on. Continue to allow your lips to speak words of blessing and always allow your mind to be open to learning each and every day. Torah is not only the words on the scroll, but the Torah of your heart given to you from one generation to the next. 149: Hear my voice as befits Your steadfast love; O God, preserve me, as is Your rule. Always allow your voice to speak clearly and be heard. Speak with kindness and compassion for all people. But remember to speak with compassion for yourself. Sometimes it’s easy to be so hard on ourselves, but take the time to not only have your voice heard by others, but also by yourself and be proud of that voice, for it will preserve you, your dreams and your future. 42: I shall have an answer for those who taunt me, for I have put my trust in Your word. Life is not always equal. There are those who taunt you, those who do not speak with kindness. Allow your answer to them be one in which you remember for yourself – be proud of who you are, what you believe and what you do. Remember to also speak out against injustice: you are a young woman who has no problem speaking her mind. You are a woman who has strong opinions. Allow your voice to ring out and be heard. You are a partner in this world for making it a better place, and that is the trust that has become your inheritance. 37: Avert my eyes from seeing falsehood; by Your ways preserve me. There are moments that deceive us – moments when we are not so comfortable or moments in which we are unsure. Dahvi, always remember to keep your eyes wide open. Pay attention to everything around you. Learn from that paths you take that may not always be the right one at the moment, because the next path will be true. Each day is an opportunity for your eyes to be open. To see blessings in your life, to see challenges that are to be overcome, and to recognize the beautiful future that lies ahead. Enjoy the journey for it will bring you a life that is filled with blessing and a world in which you will leave your imprint. Dahvi Tikvah – My Bear, Our Hope – You stand here with your family, your community and the people of Israel, and we could not be prouder of you. For the generations who came before you, who stand around you but you cannot see; for the generations that will come from you, always know that you are a blessing. You are our blessing and you are our hopes and dreams fulfilled. We love you and we are so proud of you! It’s been a busy week and this is the first opportunity I’ve had to finally post this from my tiyul to the West Bank/Judea-Samaria. The issues surrounding the West Bank or Judea/Samaria (depending on what some refer to these areas call it) are very complex. There are no black or white answers to all the questions we have regarding a future Palestinian state. While this tiyul was amazing and eye opening in the location of both Jewish and Palestinian towns as well as the difficult typography that covers the country, many of us still walked away with more questions and insights than when we began the morning. Our morning began boarding a bullet proof bus. That right there gave rise to the curious excursion we were about to embark upon. Our goal for the day; to understand the building by both sides and the land in an effort to create the borders of a two state solution. What is interesting to note is that it is believed that if it is not completed in 2-3 years, then it may never get done as both sides keep positioning themselves in certain areas requiring map drawers to have to return to the drawing board, so to say. To what extent are our issues driven by the reading of the other side? There are two dynamics: one group of Israelis who are able to sit and enjoy food together. The other who say, there will be those who will shoot us when we walk together. On one hand, there is a narrative that says that all of this land belongs to Jews. But on the other, there is the realization that we have to find a way to live together in peace…if possible. And more thoughts and hands: The stakes are high and there are two thoughts: it is only Arabs who can give us the recognition that will give us peace, but there is also a requirement to defend ourselves. As we drive through the streets of East Jerusalem, specifically, the area of Shekh Jarrah, a clear Palestinian neighborhood, we find Haredi Jews who lay claim to a small tomb of Shimon HaTzadik, that will require map drawers, such as Danny Siedemann, a lawyer and leader in the Peace camp in Israel, to redefine future borders. What is interesting about the tomb of Shimon HaTzadik is that this tomb was closed 364 days out of the year. No one visited it or made a fuss over it except on Chol Hamoed Pesach, when the community had a carnival that included Jews and Arabs alike. However, ten years ago, as talks began regarding Jerusalem and peace, the Haredi Jews began to make pilgrimage to this place and ensuring that it would be open 24/7 for all to visit and pray. Following the 1967 war, the areas around Jerusalem were annexed and neighborhoods were created to surround Jerusalem in order to never divide Jerusalem again. Later, from Mt. 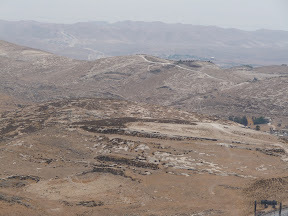 Scopus, looking down the sharp decline into the Jordan River Valley, we look upon Maalei Adumim. This was th e first city to be built in Judea/Summaria and now is home to over 20,000 people. Yet, it is right in the middle of where borders can be drawn, and again, another area in which safe travel has to be considered for Israelis into Jerusalem and around the country. Our next meeting, after traveling through East Jerusalem and now into the heart of the West Bank, to the town of Beit Aryeh, was with Colonel Danny Terza. Beit Aryeh is a beautiful settlement with 750 families. Placed here as a security town as it looks down into Tel Aviv and especially with Ben Gurion Airpots runways in clear sight. 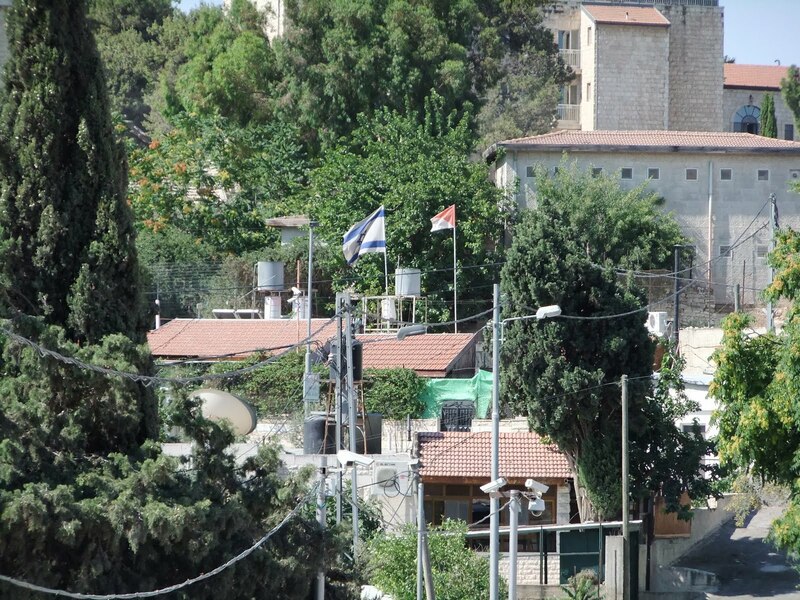 Unlike those at the tomb of Shimon HaTzadik, those who have settled here are not religious, but live here to ensure the safety of the land of Israel. When sitting in this town, it looks like any other Israeli town with it’s playgrounds, schools and community center where the kids were playing at the pool and getting ready for tiyul. Colonel Danny Terza was responsible for creating the route for the security fence, which must be noted, that only 5% of the fence is actually a wall that we see on TV. Most of the fence is literally just that, a wire fence. Terza shared that in 1947, there were not many Arabs. At that time, as we know from history, the UN created a mandate for a two state solution, one for the Arabs and another for the Jews. But Arabs did not want this and Israel was alone created and the following day after Israel declared Independence, the surrounding Arab nations tried to destroy her. In 1967, they tried again to destroy Israel. The land taken in that war was not annexed to Israel because Israel truly thought that there would be peace. But, as with any battle, the Palestinians have another story. They do not see that Jews have the right to a country for as Jews, they are a religion, not a nation, therefore, why should Jews have a state. No other religion has a state. Most Arabs think there will come a day that Jews will simply go away. But others say let’s help get them out. And the 1967 war, the Arabs insisted that they believed Israel was only trying to enlarge the borders. (keep in mind, the Israelis did not start the war) What Israel calls “terror attacks” against Israel, Palestinians call “resistance”, part of their struggle against occupation. With two narratives: one’s belief and one’s story – it makes it very hard to reconcile the two. But there were times that Israel was so close to peace. 1993, Oslo; 1995, more moves. Even in summer 2000, there was an offer to the Palestinians for almost everything; 94% of territories including the Temple Mount. Ehud Barak said to Arafat at that time, the only thing that is needed by him is for him to sign the agreement that this is the end the conflict. But Arafat walked away saying that he just couldn’t sign that. As a side note: there are two terms that are used in describing towns in the West Bank: Settlement: the government agrees to have a settlement in a particular area of the West Bank, especially for security reasons. Outpost: these are caravans of trailers and temporary facilities where people are living on private Palestinian land that the settlers did not purchase. Terza went on to explain that creating the lines is not just about creating lines as so one people can live here and the other live there – the land is so small that you still have to live together. 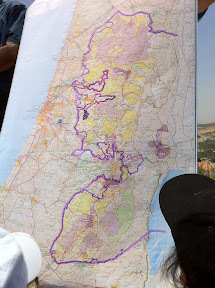 There are issues that have to be considered: issues of sewage, water, roads (such as bridges that connect Palestinian areas to Palestinian areas and Israeli to Israeli.) it is so challenging that Americans cannot just come in and make these decisions, as much as many Americans and other countries have tried to do. One has to walk all of the land and talk to all those who are living in it. There must be talks about security and borders, borders and environment, everything must come together. Since the fence was completed, only 14 people have been killed. Before the fence, over 1600 in terrorist attacks in less than two years. Next stop, Rawabi, (outside Ramalah) Palestinian development in what is called area A, that will absolutely go to Palestinians. (Note: when looking at a map of the West Bank, it is divided into sections, A, B and C. Area A is under Palestinian control, while Area C is under full Israeli control. Areas B is where Israel is in security control while Palestinians maintain civilian control. Rawabi is an active building site with city plans that take into consideration everything from infrastructure to environmental concerns. The developers are hoping to have 1000 units built in next couple of years. Yet, there are many issues that they need to overcome, including the need to build a road through Area B to help connect two other areas so trucks and construction supplies can more easily be brought in. And the recent Boycott Bill passed by the K’nesset that prevents companies in Israel to sign the agreement from Rawabi that they will not do business with Israeli companies that are in the West Bank. The developers are hoping to buy supplies from Israeli companies which could bring in millions of dollars into the Israeli economy. What did this day for me? While I did not come back feeling that the situation was now so clear, I can say, the perspectives it left me with were important. It’s easy to look at a map and say, ‘it’s so clear what the borders must be.’ But until you are in the land, driving the land, hiking the land, one has no idea the challenge the land poses. The hills and valleys make it difficult to just draw lines. The holy sites, the established communities, make it difficult to just draw lines. The emotions and the many, many years of anguish make it difficult to just draw lines. But still, there is a glimmer of hope that both peoples will be able to find a way to live in peace, the question remains….when? See! This is why it’s important to listen to those little voices and pay attention to those signs that you might just ignore. I officiated at a naming today! Now that might not sound like something to excited about or even to blog about, but this was a very special naming. It was for twin boys born last Tuesday, in Atlanta. It was for twin boys, born last Tuesday, in Atlanta, who are still there because they are only 1 lb 9 oz and 1 lb 5 oz and they are 8 days old today. Why do a naming for these boys over the phone and while they are still in the hospital? Because they are 8 days old and they are truly blessings to their parents and family here in California. Today, we took a deep breath, recited blessings for thanksgiving and for healing. Today, we named two beautiful boys and we prayed like we never prayed before that God watch over them and allow them to grow…one breath at a time. Showed up to the temple on Sunday morning. No religious school, no meetings, no one else but those who were meeting me for our meeting. I pull into my spot and noticed, MY SIGN WAS GONE! Hello! It was clearly marked, “Reserved Rabbi.” Who would want a Rabbi sign? Do you have any idea how long it took me to get my Reserved Rabbi sign? 11 years ago, after the shooting at the JCC in LA, the board decided that it would be best if we removed the titles of all those who have reserved parking spots. We all complied, but what did this mean? Anyone could assume that “reserved” meant reserved for them! I’ve had my spot and now, someone took it! Monday morning, the fabulous Jill started scouring the video records from the weekend and guess what…we caught him! The two climbed out of the car, got the post and put it in the back of the car. BTW, they wrapped the dirty bottom in a blanket to make sure they didn’t get any mud in the car! The crazy thing, they did this all at 5:30 in the afternoon, bright day light! My sign is probably hanging in some kid’s dorm room. Don’t know that it’s going to get him any good parking spots, but maybe it will get him the girl. As for my spot – it’s still bare and I’m just waiting to show up for the next big event at the temple tonight and find that I don’t have a place to park. If you’re in my spot when I get there, don’t be surprised if you go out to your car and find you can’t leave because I’m parked behind you. Just let me know when you’re ready to leave. When does free speech cross the line? At what point does the University take a stand and say, enough is enough. Expressing one’s views has to also be tempered with listening and entering into a dialogue. The MSU students from both UCI and Riverside crossed the line of descent conduct. From the video posted by the Register and accounts from those in the Jewish community, Monday night’s disruption was not meant to engage in dialogue, but rather insight hate. It is time for UCI to take a stand. While academic free speech may encourage challenging programs, outright disrespect and disruptions like what took place at Ambassador Oren’s presentation crosses a line. If we truly wish to engage in a dialogue toward peace, then we have to listen to one another and actually dialogue. Shouting insults and even rude hand jestures exchanged Monday night does nothing to promote free speech. It is embarassing for not only UCI, but for all of us when such a dignitary comes to our community and has to waste 30 minutes for a crowd to come under control. To Ambassador Oren’s credit, he stayed, finished his talk and expressed his disappointment that the MSU students could not have the patience to enter into a conversation. Where is the line of freedom of speech and hate speech? I believe it was crossed Monday night and now we must stand up and say enough and not be afraid to confront those who only know how to speak hate.